Today saw the first part of Potter & Potter Auctions two-part sale of Norm Nielsen's legendary magic poster collection. 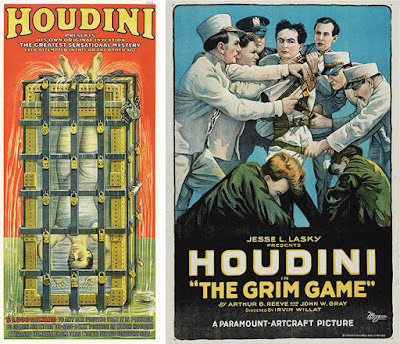 Among the 324 lots were several rare Houdini posters. Here are the auction results (including buyer's premium). A 1916 lithograph for Houdini's Water Torture Cell was the highest selling poster in the auction with $45,600. A healthy price to be sure, but a bit below the estimate of $50,000 - $70,000. A one-sheet for Houdini's The Grim Game sold for $24,000 with just one bid! It fell well below the $40,000 - $60,000 estimate and suggests the 2013 sale, in which this same poster took $67,166, was a fluke. 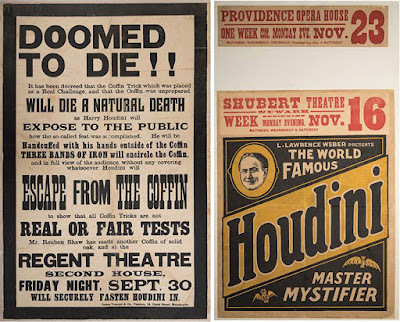 A Houdini "DOOMED TO DIE!!" broadside beat the auction estimate of $3,000 - $4,000 and brought in $6,720. 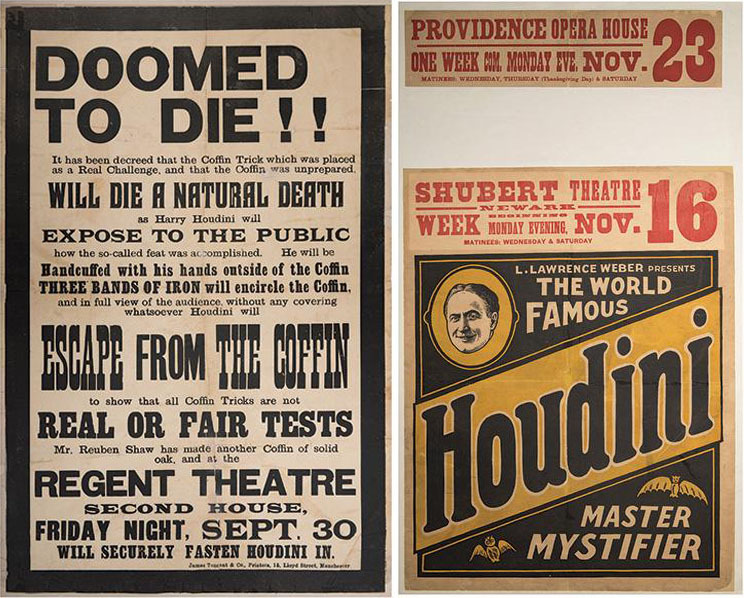 A 1925 poster is for Houdini's "3 Shows in One" fell right within the estimate at $2,400. 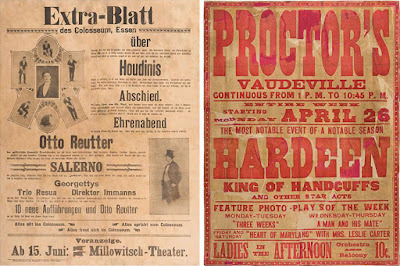 A German playbill for Houdini's 1902 appearance at the Colosseum in Essen sold for $1,920. Hardeen showed that he could surprise like his brother by tripling the low end of his auction estimate and adding $600 to the family. In other results, the only know example of an Okito poster blew away the $10,000 - $15,000 auction estimate and crept into Houdini territory with a final price of $26,400 (second highest price of the auction). A one-of-a-kind Blackstone poster took in an impressive $18,000. A poster for Thurston as Kellar's Successor sold for $19,200 (short of the $25,000 - $35,000 estimate). Among more modern magicians, a poster for Doug Henning's own Water Torture Cell took in $300. An Amazing Randi Milk Can poster found a buyer at $600. A 1980 Richiardi Jr. poster surprised with $2,280 (estimate $400 - $600). Potter & Potter issued a beautiful hardbound auction catalog for this sale, which is a collector's item in itself. You can download or purchase a copy at their website. The auction house has not yet announced a date for The Nielsen Collection Part II. 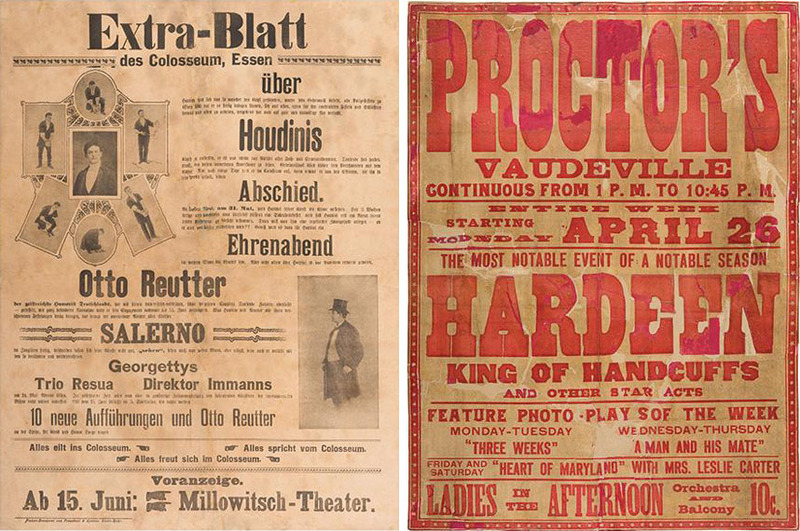 It will exciting to see what Houdini posters that next auction might contain. My late father swapped a number of old posters to Norm Nielsen a number of years back, in exchange for one of his custom reproduction props. I think at least one of Dad's old posters was sold at the recent auction.